Fire Extinguishers should be located in conspicuous positions, available at all times for immediate use and fitted on brackets or stands where they will be readily accessible to people following an escape route. They should be hung securely on wall brackets. Where this is impractical, extinguishers should be located on suitable stands (not on the floor). If mounted on a wall, the carrying handle of larger, heavier extinguishers should be one metre from the floor, but smaller extinguishers should be mounted so that the carrying handle is one and a half metres from the floor. Extinguishers should be sited in such a way that means it is not necessary to travel more than thirty metres from the site of a fire to reach an extinguisher. To avoid confusion, all extinguishers installed in any one building of single occupancy should have the same method of operation and, if intended for the same function, they should be similar in shape, appearance and colour. 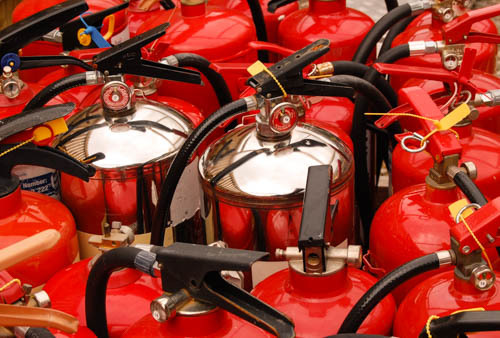 Wherever possible, portable extinguishers should be grouped to form a fire point.